Now that there is a new tax regime in place I thought I would discuss it one more time with some additional thoughts. It does appear that while most parts of the country will not be significantly impacted by the mortgage interest deduction being reduced to $750,000 for future home purchases, some high-income individuals will be hit pretty hard. According to ATTOM Data Solutions, only about 4% of purchased mortgages originated in 2017 exceeded $750,000. On the other hand, according to the Wall Street Journal, there are some high-cost regions that will get hit very hard. In Manhattan, for example, 64% of purchase mortgages made this year were for more than $750,000, according to ATTOM. In San Francisco, that proportion is 58%, and the surrounding counties of San Mateo, Marin, and Santa Clara register between 44% and 55%. Black Knight Inc., a mortgage data, and technology firm calculates there are about 684,000 active mortgages with current balances over $750,000. Black Knight estimates that about 107,000 loans expected to be made in 2018 would fall above the $750,000 cap. 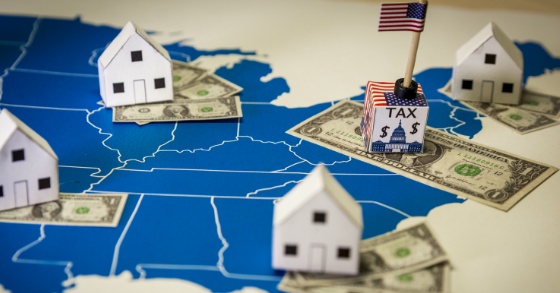 The high tax, high housing price states are also vulnerable because of the curtailment of write-offs of state and local income taxes (SALT) and property taxes being limited to $10,000. This makes these states less competitive in some ways, although, for high-income earners who were paying the Alternative Minimum Tax, some of these deductions were limited already so they may not be hit as badly as one would initially think. The following chart shows the percentage of tax returns with SALT deductions and the average value of those deductions. The above chart shows that the most exposed states are California, New York, Connecticut, New Jersey and to some extent Maryland. With the exception of Maryland, these states are very top heavy in terms of high earners paying a very large percentage of state taxes. So the real question is will these changes result in high earners leaving these states for lower cost destinations? The following chart is from an interesting analysis done by Ray Dalio and shows why this question is so important. 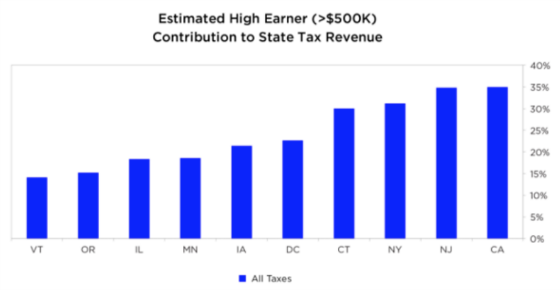 For Connecticut, New York, New Jersey, and California, the top earners pay approximately 35% of the taxes. If these people stay then these states should be able to absorb the higher costs of living there. If they leave, however, then real problems can arise. The first three states do not have the weather of California and as much foreign appeal so I see them as being far more vulnerable. They also have poor population growth characteristics as compared to higher growth states with lower taxes such as Texas, Florida, and Nevada as the following chart shows. Clearly, the latter three are growing at meaningfully higher rates than the first four. Here is how Ray Dalio sees the winners and losers from tax reform. With the exception of North Carolina, which is neutral, all of CWS’ primary investment markets are theoretical beneficiaries of the changes in the tax laws. We shall see how reality plays out. 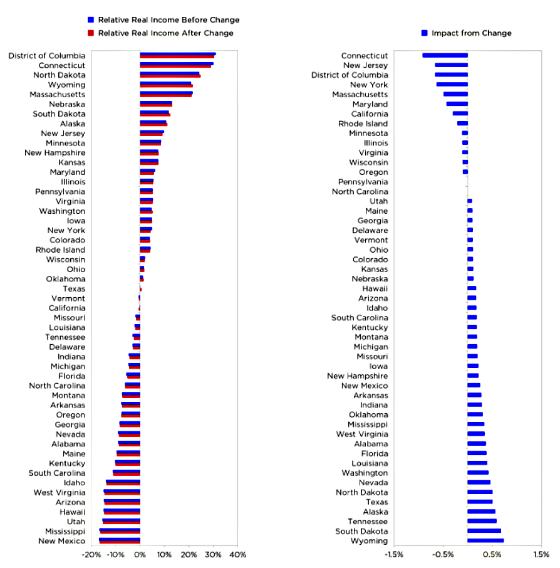 Dalio is pessimistic about the prospects for the most negatively impacted states because of the disproportionate impact that high earners can have on state finances and the overall economy if they pack up and leave. As you can see, everything points toward states like New York, Connecticut, New Jersey, California, and Illinois being the most vulnerable, and states like Florida, Texas, Nevada, Washington, and Arizona benefiting the most from this shift. CWS happens to be invested in all of those states with the exception of Nevada and Florida so from a CWS perspective this is encouraging. With that being said there is a lot of talk among blue states about workarounds to preserve similar deductions so these states do not lose out from the tax law changes. As an aside, I was at a lunch and was talking to a partner in an accounting firm who said that they have already been told by their Washington tax experts that they have currently come up with 35 loopholes to help their clients, almost all of whom are in California. These changes will create enormous incentives for those negatively impacted by them to find loopholes to lessen the impact. This clearly creates a more level playing field between renting and owning. While it may not change a number of people’s decision to purchase a home, what it does do is take away an incentive to buy a home as one can get just as big of a write off via the standard deduction by renting as they can if they are buying. In addition, renting comes without the capital intensity of homeownership and the illiquidity and immobility this sometimes engenders. At the margin I can’t see how it won’t lead to more people staying as renters for longer but time will tell. According to Zillow, at least 23 million fewer households will be motivated to buy a new home under the new law. This seems quite high to me but if it’s anywhere near that number, it will be beneficial for landlords. Another impact on housing and the economy is that there will now be less incentive to take out home equity loans and tap into existing ones as interest will no longer be deductible. Overall I think that landlords should benefit as well as lower cost, lower tax states that should see an economic boost due to more in-migration from high tax, higher cost states. On the surface, this would appear to be beneficial to CWS and other apartment owners invested in states like Texas, Washington, Arizona, Washington, Georgia, and Colorado. Are you a homeowner or a renter? Are you planning to make changes based on the new tax law? For me, my home is paid off except for a home equity loan which I will now morph into a new mortgage of same amount. I predict a boon in small new mortgages.